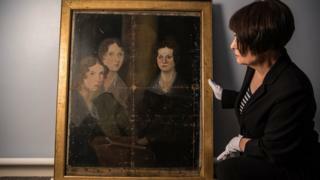 The only-known surviving portrait of Charlotte, Emily and Anne Bronte together has returned to the literary's family's home in Haworth. It was painted by their brother Branwell in 1834 and then bought by the National Portrait Gallery in 1914 after it was rediscovered. The painting is returning to West Yorkshire to mark the 200th anniversary of Emily Bronte's birth. It is at the Bronte Parsonage Museum for the first time since 1984. It will be hung on the wall of the exhibition room in its former home, and previously only a copy hung in the museum. Ann Dinsdale, the museum's curator, said: "It's a big day for the parsonage." The painting is creased because it was discovered folded up on top of a cupboard in 1914 by the second wife of Charlotte's husband. Its existence was known of because it was described by novelist Elizabeth Gaskell in 1853. In the centre of the painting a figure can be seen concealed by a pillar painted over it. It is thought the ghostly image could well be Branwell. Ms Dinsdale said of the painter brother "he never quite mastered the technique of painting in oils". The portrait will be on display until the end of August before returning to the National Portrait Gallery. Charlotte - born on 21 April 1816, she was the eldest of the siblings to reach adulthood, but the last to die. She wrote Jane Eyre, Shirley and Villette, and died on 31 March 1855, aged 38. Branwell - born in 1817, was the only Bronte brother. He was a writer and painter and died in 1848, aged 31. Emily - born on 30 July 1818, wrote Wuthering Heights but died of tuberculosis aged 30 in December 1848, two months after the same illness killed her brother. Anne - born on 17 January 1820, wrote Agnes Grey and The Tenant of Wildfell Hall. She died in May 1849, aged 29. They had two older sisters, Maria and Elizabeth, who died during childhood.